For other uses, see Waltzing Matilda (disambiguation). The original lyrics were written in 1895 by Australian poet Banjo Paterson, and were first published as sheet music in 1903. Extensive folklore surrounds the song and the process of its creation, to the extent that it has its own museum, the Waltzing Matilda Centre in Winton, in the Queensland outback, where Paterson wrote the lyrics. In 2012, to remind Australians of the song's significance, Winton organised the inaugural Waltzing Matilda Day to be held on 6 April, the anniversary of its first performance. The song was first recorded in 1926 as performed by John Collinson and Russell Callow. In 2008, this recording of "Waltzing Matilda" was added to the Sounds of Australia registry in the National Film and Sound Archive which says that there are more recordings of "Waltzing Matilda" than any other Australian song. Combo Waterhole, thought to be the location of the story that inspired "Waltzing Matilda"
The Australian poet Banjo Paterson wrote the words to "Waltzing Matilda" in January 1895 while staying at Dagworth Station, a sheep and cattle station near Winton in Central West Queensland owned by the Macpherson family. The words were written to a tune played on a zither or autoharp by 31‑year‑old Christina Macpherson (1864–1936), one of the family members at the station. The march was based on the music the Scottish composer James Barr composed in 1818 for Robert Tannahill's 1806 poem "Thou Bonnie Wood of Craigielee". In the early 1890s it was arranged as "The Craigielee" march music for brass band by Australian composer Thomas Bulch. Fortified temporary shearing shed at Dagworth Station following the 1894 arson of the main shed. The three troopers at left are thought to be those referred to in "Waltzing Matilda", while the squatter was Bob Macpherson, fourth from right. 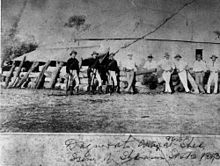 In Queensland in 1891 the Great Shearers' Strike brought the colony close to civil war and was broken only after the Premier of Queensland, Samuel Griffith, called in the military. In September 1894, some shearers at Dagworth Station were again on strike. The situation turned violent with the striking shearers firing their rifles and pistols in the air and setting fire to the woolshed at Dagworth, killing dozens of sheep. The owner of Dagworth Station and three policemen gave chase to a man named Samuel Hoffmeister, a German immigrant also known as "Frenchy". Rather than be captured, Hoffmeister shot and killed himself at the Combo Waterhole. Bob Macpherson (the brother of Christina) and Paterson are said to have taken rides together at Dagworth. Here they would probably have passed the Combo Waterhole, where Macpherson is purported to have told this story to Paterson. Although not remaining in close contact, Paterson and Christina Macpherson both maintained this version of events until their deaths. Amongst Macpherson's belongings, found after her death in 1936, was an unopened letter to a music researcher that read "... one day I played (from ear) a tune, which I had heard played by a band at the Races in Warrnambool ... he [Paterson] then said he thought he could write some words to it. He then and there wrote the first verse. We tried it and thought it went well, so he then wrote the other verses." Similarly, in the early 1930s on ABC radio Paterson said "The shearers staged a strike and Macpherson's woolshed at Dagworth was burnt down and a man was picked up dead ... Miss Macpherson used to play a little Scottish tune on a zither and I put words to it and called it Waltzing Matilda." The song itself was first performed on 6 April 1895 by Sir Herbert Ramsay at the North Gregory Hotel in Winton, Queensland. The occasion was a banquet for the Premier of Queensland. In February 2010 ABC News reported an investigation by barrister Trevor Monti that the death of Hoffmeister was more akin to a gangland assassination than to suicide. The same report asserts, "Writer Matthew Richardson says the song was most likely written as a carefully worded political allegory to record and comment on the events of the shearers' strike." A number of alternative theories for the origins or meaning of "Waltzing Matilda" have been proposed since the time it was written, but most experts now essentially agree on the details outlined above. Some oral stories collected during the twentieth century claimed that Paterson had merely modified a pre-existing bush song, but there is no evidence for this. In 1905, Paterson himself published a book of bush ballads he had collected from around Australia entitled Old Bush Songs, with nothing resembling "Waltzing Matilda" in it. Nor do any other publications or recordings of bush ballads include anything to suggest it preceded Paterson. Meanwhile, handwritten manuscripts from the time the song originated indicate the song's origins with Paterson and Christina Macpherson, as do their own recollections and other pieces of evidence. In 2008 amateur Australian historian Peter Forrest claimed that the widespread belief that Paterson had penned the ballad as a socialist anthem, inspired by the Great Shearers' Strike, was false and a "misappropriation" by political groups. Forrest asserted that Paterson had in fact written the self-described "ditty" as part of his flirtation with Macpherson, despite his engagement to someone else. This theory was not shared by other historians like Ross Fitzgerald, emeritus professor in history and politics at Griffith University, who argued that the defeat of the strike in the area that Paterson was visiting only several months before the song's creation would have been in his mind, most likely consciously but at least "unconsciously", and thus was likely to have been an inspiration for the song. Fitzgerald stated, "the two things aren't mutually exclusive"—a view shared by others who, while not denying the significance of Paterson's relationship with Macpherson, nonetheless recognise the underlying story of the shearers' strike and Hoffmeister's death in the lyrics of the song. In 1903 Marie Cowan was hired to alter the song lyrics for use as an advertising jingle for Billy Tea, making it nationally famous. A third variation on the song, with a slightly different chorus, was published in 1907. Paterson sold the rights to "Waltzing Matilda" and "some other pieces" to Angus & Robertson for five Australian pounds. Although no copyright applied to the song in Australia and many other countries, the Australian Olympic organisers had to pay royalties to an American publisher, Carl Fischer Music, following the song being played at the 1996 Summer Olympics held in Atlanta. According to some reports, the song was copyrighted by Carl Fischer Music in 1941 as an original composition. However, The Sydney Morning Herald said that Carl Fischer Music had collected the royalties on behalf of Messrs Allan & Co, an Australian publisher that claimed to have bought the original copyright, though Allan's claim "remains unclear". Arrangements such as those claimed by Richard D. Magoffin remain in copyright in America. There are no "official" lyrics to "Waltzing Matilda" and slight variations can be found in different sources. This version incorporates the famous "You'll never catch me alive said he" variation introduced by the Billy Tea company. Paterson's original lyrics referred to "drowning himself 'neath the Coolibah Tree". The following lyrics were adapted by tea trader James Inglis and set to music in 1903 by his accountant's wife Marie Cowan to advertise Billy Tea. "Whose is that jumbuck[N 2] you've got in your tucker bag? ^ sometimes "Where's that jolly jumbuck"
derived from the German term auf der Walz, which means to travel while working as a craftsman and learn new techniques from other masters. a romantic term for a swagman's bundle. See below, "Waltzing Matilda". from the above terms, "to waltz Matilda" is to travel with a swag, that is, with all one's belongings on one's back wrapped in a blanket or cloth. The exact origins of the term "Matilda" are disputed; one fanciful derivation states that when swagmen met each other at their gatherings, there were rarely women to dance with. Nonetheless, they enjoyed a dance and so danced with their swags, which was given a woman's name. However, this appears to be influenced by the word "waltz", hence the introduction of dancing. It seems more likely that, as a swagman's only companion, the swag came to be personified as a woman. a man who travelled the country looking for work. 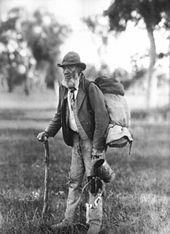 The swagman's "swag" was a bed roll that bundled his belongings. Australian squatters started as early farmers who raised livestock on land which they did not have the legal title to use; in many cases they later gained legal use of the land even though they did not have full possession, and became wealthy thanks to these large land holdings. The squatter's claim to the land may be as uncertain as the swagman's claim to the jumbuck. The lyrics of "Waltzing Matilda" have been changed since it was written. Who'll come a waltzin' Matilda with me? You'll come a waltzin' Matilda with me. Who'll come a roving Australia with me? Waltzing Matilda and leading a tucker bag. It has been suggested that these changes were from an even earlier version, and that Paterson was talked out of using this text, but the manuscript does not bear this out. In particular, the first line of the chorus was corrected before it had been finished, so the original version is incomplete. Up rose the troopers—one, two, a and three. "Whose the jolly jumbuck you've got in the tucker-bag? You'll come a waltzing Matilda with we." Drowning himself by the Coolibah tree. By contrast with the original, and also with subsequent versions, the chorus of all the verses was the same in this version. This is also apparently the only version that uses "billabongs" instead of "billabong". 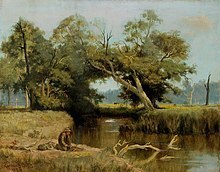 Current variations of the third line of the first verse are "And he sang as he sat and waited by the billabong" or "And he sang as he watched and waited till his billy boiled". Another variation is that the third line of each chorus is kept unchanged from the first chorus, or is changed to the third line of the preceding verse. Who'll come a'waltzing Matilda my darling? Whose is the jumbuck you've got in your tucker bag? In May 1988 the Australasian Performing Right Association (APRA) Chief Executive, John Sturman, presented five platinum awards, "which recognised writers who had created enduring works which have become a major part of the Australian culture", at the annual APRA Awards ceremony as part of their celebrations for the Australian Bicentenary. One of the platinum awards was for Paterson and Cowan's version of "Waltzing Matilda". Australian passports issued from 2003 have had the lyrics of "Waltzing Matilda" hidden microscopically in the background pattern of most of the pages for visas and arrival/departure stamps. "Waltzing Matilda" was used at the 1974 FIFA World Cup and at the Montreal Olympic Games in 1976 and, as a response to the New Zealand All Blacks haka, it has gained popularity as a sporting anthem for the Australia national rugby union team. It is also performed, along with "Advance Australia Fair", at the annual AFL Grand Final. Matilda the Kangaroo was the mascot at the 1982 Commonwealth Games held in Brisbane, Queensland. Matilda was a cartoon kangaroo, who appeared as a 13-metre (43 ft) high mechanical kangaroo at the opening ceremony, accompanied by Rolf Harris singing "Waltzing Matilda". The Australian women's national soccer team is nicknamed the Matildas after this song. It is used as the quick march of the 1st Battalion, Royal Australian Regiment and as the official song of the US 1st Marine Division, commemorating the time the unit spent in Australia during the Second World War. Partly also used in the British Royal Tank Regiment's slow march of "Royal Tank Regiment", because an early British tank model was called "Matilda". In 1995, it was reported that at least 500 artists in Australia and overseas had released recordings of "Waltzing Matilda", and according to Peter Burgis of the National Film and Sound Archive, it is "one of the most recorded songs in the world". Among the artists and bands who have covered the song include Rod Stewart, Chubby Checker, Liberace, Harry Belafonte, Bill Haley and the Comets, the Mormon Tabernacle Choir, Helmut Lotti, Wilf Carter (Montana Slim), the Irish Rovers, and Burl Ives, The Swingle Singers and the Red Army Choir. Jimmie Rodgers had a US#41 pop hit with the song in 1959. On 14 April 1981, on Space Shuttle Columbia's first mission, country singer Slim Dusty's rendition was broadcast to Earth. In the Kidsongs 1986 recording I'd Like to Teach the World to Sing where Mr. World and the Kidsongs Kids visit the Australians, the final two verses were replaced with the repeat of the first verse to make it more kid-friendly. Only this time, new words such as "Traveller" took the original ones' places such as "Swagman". Versions of the song have been featured in a number of mainly Australian films and television programs. Ernest Gold used the song and variations of it extensively in the 1959 film On the Beach. The 2017 short film Waltzing Tilda features various versions of the song and it is also sung by the main character. It is the theme song for Australia in the video game Civilization VI. "Waltzing Matilda" is a fixture at many Australian sporting events. Jessica Mauboy and Stan Walker recorded a version of "Waltzing Matilda" to promote the 2012 Summer Olympics in Australia. It was released as a single on 3 August 2012. During the 1950s, a parody of the original entitled "Once a Learned Doctor" gained some currency in university circles. It featured lyrics rewritten with reference to the split in the Australian Labor Party in the period 1954 to 1957. In 1961, Australian songwriter Jack O'Hagan provided new lyrics to the traditional tune to be called "God Bless Australia" (see that article for its lyrics) that he hoped would become the Australian national anthem. "And the Band Played Waltzing Matilda" was written by Scottish-Australian songwriter Eric Bogle in 1971. The song concerns the Australian experience at the Battle of Gallipoli and Anzac Day. At its conclusion, the song incorporates the melody and a few lines of "Waltzing Matilda"'s lyrics. Rambling Syd Rumpo (played by Kenneth Williams) in the late 1960s BBC radio programme Round the Horne did a parody of "Waltzing Matilda" beginning "Once long ago in the shade of a goolie bush..."
The Family Car Songbook (1983) presents a "translation" of the song, using the same musical score, into an "American" version. Tom Waits' 1976 song "Tom Traubert's Blues" incorporates elements of "Waltzing Matilda". ^ "Who'll Come A Waltzing Matilda With Me?". National Library of Australia. Archived from the original on 6 June 2011. Retrieved 3 October 2015. ^ Oxford English Dictionary, Draft Revision March 2001. "Matilda, n."
^ "Waltzing Matilda Centre". Matildacentre.com.au. Archived from the original on 13 June 2012. Retrieved 7 January 2013. ^ a b Arthur, Chrissy (6 April 2012). "Outback town holds first Waltzing Matilda Day". ABC News. ^ "Waltzing Matilda Day". Waltzing Matilda Centre, Winton. Archived from the original on 27 March 2012. ^ "National Film and Sound Archive: Waltzing Matilda on australianscreen online". Aso.gov.au. Retrieved 7 January 2013. ^ Ponnamperuma, Senani. "Waltzing Matilda Australia's Favourite Song". ^ a b c d e f g O'Keeffe, Dennis (2012). Waltzing Matilda: The Secret History of Australia's Favourite Song. Sydney: Allen and Unwin. ISBN 978-1-74237-706-3. ^ National Library of Australia, Robyn Holmes (7 June 2011). "National Library of Australia history". Nla.gov.au. Archived from the original on 14 June 2011. Retrieved 7 January 2013. ^ Semple, David. "The Poems and Songs of Robert Tannahill: Songs – Bonnie Wood O Craigielee". Retrieved 20 January 2013. ^ National Library of Australia, Robyn Holmes (7 June 2011). "National Library of Australia "The Creation"". Nla.gov.au. Archived from the original on 14 June 2011. Retrieved 7 January 2013. ^ Lindner, W. Benjamin (2019). Waltzing Matilda – Australia's Accidental Anthem: A Forensic History. foreword by Geoffrey Blainey. Boolarong. ISBN 9781925877076. ^ "Waltzing Matilda an old cold case". www.abc.net.au. Retrieved 18 May 2018. ^ "Waltzing Matilda an old cold case". ABC News. Australian Broadcasting Corporation. 10 February 2010. Retrieved 20 January 2013. ^ National Library of Australia, Robyn Holmes (1 June 2011). "National Library of Australia "The Bold Fusilier"". Nla.gov.au. Archived from the original on 14 June 2011. Retrieved 7 January 2013. ^ The Times, 15 September 2003, "Sporting anthems", Section: Features; p. 17. ^ a b c ""Waltzing Maltida" a little ditty, historians say". ABC News. 5 May 2008. ^ a b c Safran, John (20 December 2002). ""Waltzing Matilda", courtesy of a tea-leaf near you". The Sydney Morning Herald. ^ Pollack, Michael (25 January 2001). "Screen Grab; Tale of the Jumbuck and the Billabong, Interpreted". The New York Times. ^ Clarke, Roger (2001). "Copyright in "Waltzing Matilda"". Roger Clarke's "Waltzing Matilda" site. Archived from the original on 9 July 2008. Retrieved 3 November 2008. The copyright has presumably expired in Australia (and in almost every other country in the world), because in most Western countries copyright lasts for only 50 years after the death of the originator. Carl Fischer Musics' copyright hold is due to end in 2011. Banjo Paterson died in 1941 and Marie Cowan in 1919, so these copyrights ought to have expired in 1991 and 1969 respectively. In the United States other rules hold and copyright for the song still appears to exist. It is claimed by Carl Fischer New York Inc.
^ Greg Pemberton (14 August 2015). "Waltzing Matilda's origins and chain of ownership murky". The Sydney Morning Herald. Retrieved 27 December 2016. ^ "WebVoyage Record View 1". Cocatalog.loc.gov. Retrieved 1 July 2009. ^ For instance, compare the lyrics at the National Library of Australia to those at "Waltzing Matilda". Australian National University. 9 June 2007. Archived from the original on 9 June 2007. Retrieved 20 February 2017. ^ "A Popular Bush Song". The Capricornian (1875–1929). Rockhampton, Queensland: National Library of Australia. 14 December 1901. p. 8. Retrieved 10 October 2011. ^ "Who'll come a Waltzing Matilda with me?". National Library of Australia. Archived from the original on 1 April 2011. Retrieved 1 July 2009. 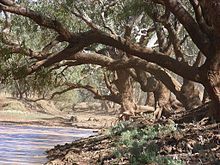 ^ ""Waltzing Matilda" – Lyrics, midi, history". Chinarice.org. Archived from the original on 13 December 2007. Retrieved 1 July 2009. ^ a b Watt, Ian (19 May 1988). "They write the songs that make the whole world sing". The Canberra Times. 62 (19, 218). p. 26. Retrieved 10 July 2016 – via Trove. ^ "1988 APRA Music Award Winners". Australasian Performing Right Association (APRA). Retrieved 10 July 2016. ^ "Plebiscite results – see 1977 National Song Poll". Elections and referendums. Department of the Parliament (Australian federal government). 2002. Archived from the original on 20 November 2007. Retrieved 21 November 2007. ^ "Passport gets the hop on fraudsters". Archived from the original on 7 December 2003. ^ "A word to the wise guy – Sport". The Sydney Morning Herald. 9 April 2005. Retrieved 1 July 2009. ^ Independent Online (27 October 2007). "News – SA Soccer: If a name works, why fix it?". Iol.co.za. Retrieved 1 July 2009. ^ "1st Marine Division celebrates 65 years". US Fed News Service, Including US State News. 9 February 2006. Archived from the original on 17 February 2008. Retrieved 14 February 2008. Major Gen. Richard F. Natonski and Sgt. Maj. Wayne R. Bell cut the ribbon to the "Waltzing Matilda", the 1st Marine Division's official song. ^ Clarke, Roger (2003). "Roger Clarke's "Waltzing Matilda" Home-Page". Roger Clarke (hosted on ANU computers). Archived from the original on 9 February 2008. Retrieved 14 February 2008. I understand that the tune (without the words) is the marching song of the US 1st Marine Division. In 2003, Col Pat Garrett USMC confirmed that it was/is played every morning immediately after The Marines Hymn ('From the Halls of Montezuma ...') following the raising of the National colo(u)rs at 0800, and at Divisional parades. Further, "The Division was raised at Camp Lejeune, North Carolina in early 1941, and became associated with "Waltzing Matilda" when the Marines came to Melbourne in early 1943 for rest and refit following the successful retaking of Guadalcanal, and before it returned to combat at Cape Gloucester in New Britain in the Northern Solomons in September of that year"
^ a b "Banjo's bush tale still waltzing its way into the charts and hearts" (27 January 1995), The Canberra Times. Retrieved 12 August 2018. ^ "Waltzing Matilda – Burl Ives – Song Info". AllMusic. Retrieved 19 March 2018. ^ Inc, Nielsen Business Media (15 February 1960). "Billboard". Nielsen Business Media, Inc. Retrieved 19 March 2018 – via Google Books. ^ STS-1 audio (Orbit 16). April 14, 1981. Recorded at Orroral Valley Tracking Station. Retrieved 30 January 2019. ^ Country singer Slim Dusty, whose recording of the song.... 14 April 1981. From UPI archives. Retrieved 30 January 2019. ^ George Burt (1994). The Art of Film Music. University Press of New England. p. 68. ISBN 9781555532703. ^ "Episode 5 – Waltzing Tilda – Filmmakers – Jonathan Wilhelmsson, Raquel Linde & Holly Fraser". Retrieved 21 November 2018. ^ "Sunday Shorts: Waltzing Tilda". Cinema Australia. 2 July 2017. Retrieved 21 November 2018. ^ Firaxis Games (21 February 2017). Civilization VI – First Look: Australia. Retrieved 23 February 2017. ^ "Stan Walker and Jessica Mauboy to Release New Collaboration Together for the Olympics". Take 40 Australia, MCM Entertainment. 20 July 2012. Archived from the original on 20 September 2012. Retrieved 27 February 2013. ^ "iTunes – Music – Waltzing Matilda – Single by Jessica Mauboy & Stan Walker". iTunes Store (Australia). Retrieved 3 August 2012. ^ Griffith, Tony (2005). "Chapter 4: Beating the Bolshoi". Beautiful Lies: Australia from Menzies to Howard. Australia: Wakefield Press. pp. 57–58. ISBN 1-86254-590-1. ^ Bebbington, Warren (1997). The Oxford Companion to Australian Music. Oxford University Press. pp. 427–428. ^ Casimir, Jon (20 April 2002). "Secret life of Matilda". The Sydney Morning Herald. ^ "Rambling Syd's Ganderbag". Freespace.virgin.net. Archived from the original on 27 September 2011. Retrieved 7 January 2013. ^ Mossman, Tam. (1983). The Family Car Song Book. Philadelphia: Running Press. Wikimedia Commons has media related to Waltzing Matilda.